Could we have already braved the worst case scenario? It’s small consolation, but new research suggests that something along the lines of the 2004 tsunami, which left such crippling devastation in its wake, is the direst Sri Lanka could face. 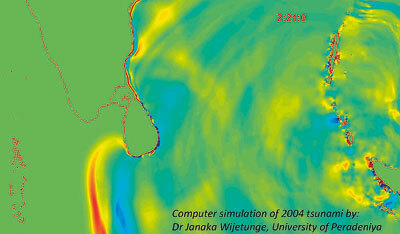 Using computer modelling, Dr. Janaka Wijetunga, a senior lecturer at the Department of Civil Engineering, University of Peradeniya explored what tsunamis from nine different subduction zones in the Indian Ocean could look like, providing estimates of arrival times and the maximum heights of sea waves. His calculations suggest that even mega-tremblors in any of the other seismic zones in the Indian Ocean would generate tsunami wave heights around the island which are only about 20-30% of those triggered by an earthquake similar to the 2004 tsunami from the Northern Sumatra-Andaman seismic zone. Dr. Wijetunge who received his Ph.D. in Coastal Engineering from Cambridge University is also the Director of the Centre for Engineering Research and Postgraduate Studies and the author of over 75 papers. His latest, published in Coastal Engineering in March offers a temporary solution – what amounts to a substitute for a comprehensive database of pre-computed tsunami scenarios. Nine out of the 10 largest earthquakes to occur in the last 100 years had been in subduction zones and by detailing what the worst case scenarios for the nine likeliest candidates around Sri Lanka are, Dr. Wijetunge has provided a rough guide to help prepare us. For example, a tsunami generated due to an earthquake in Sunda trench off southern Sumatra and Java as well as in Makran trench off the south coast of Pakistan and Iran are less likely to cause significant impact than one generated in the northern Sumatra-Andaman seismic zone as well as perhaps those that may occur in the Arakan trench off Myanmar, says Dr. Wijetunge. However, collecting data has been a challenging process for the researcher, particularly as there is a dearth of sufficiently high resolution topographic data for the North and East coasts. While an event like the 2004 tsunami is only likely to occur once every several hundred years, there’s no forgetting how horribly unprepared we were for the tsunami in 2004. In the days following it, it was clear to Dr. Wijetunge that “we in Sri Lanka, and in many other countries around the Indian Ocean, had done very badly in the face of this enormous natural hazard; death and destruction was immense along nearly two-third of the country’s coastline.” The enormity of the tragedy made it clear just how vulnerable our ignorance had left us. However, the contrast with our most recent tsunami scare is heartening. Dr. Wijetunge says he received the general alert from the Disaster Management Centre (DMC) within a few minutes of the massive quake off the west coast of northern Sumatra. It’s an indication that tsunami preparedness efforts in the country have given fruit. Between the evacuation drills and tsunami inundation maps that have been made for the entire country, we’re far better equipped to avoid at the very least such a massive loss of life. But the scare also offered a timely reminder that not every tremor should trigger a full scale evacuation, causing widespread panic and inconvenience to the populace at large. Tsunami alerts could borrow from the traffic light system, suggests Dr. Wijetunge. There is a real danger that the public will start dismissing alerts – at our peril – if every one is a ‘full’ warning. “We must realize that we will have many tsunami scares like in the last week, and previously in March 2005 and in September 2007, prior to the next really big one, that is a 2004 like event.” It would make sense to classify the level of the tsunami threat, following countries like USA and Japan. “For example, we can have three or four levels of tsunami threat with appropriate colour coding for each,” he says explaining that ‘Red’ could stand for full scale evacuation while at the other end of the spectrum ‘Green’ could be for no threat or minor waves at most. Dr. Wijetunge also stresses the need to better equip coastal communities to deal with other hazards such as flooding caused by tropical cyclone induced storm surges, beach erosion, potential sea level rise and oil spills. Sri Lanka has been hit with severe cyclones in the past, which claimed hundreds of lives. While death tolls are lower, these events are more frequent than tsunamis and for certain parts of the country, such as the city of Mannar, they may pose an even greater danger. It’s why Dr. Wijetunge feels compelled to end on a cautionary note: “whilst improving our tsunami preparedness, we must also pay due attention to the potential threat from other hazards as well,” he says. Published in the Sunday Times, Sri Lanka on April 22, 2012. Words by Smriti Daniel. Illustration courtesy Janaka Wijetunge. Tags: A researcher investigates 9 tsunami scenarios for Sri Lanka. Bookmark the permalink.